The "in" thing these days in youth hockey, and even pro hockey, seems to be having the ability to go "bar down". If you're new to hockey, the idea is that the player shoots at the lower side of the cross bar and the puck then deflects down into the net behind the goaltender. When executed with authority, yeah, I'll admit, it's pretty awesome. All of the kids want to do it and, boy, do they all try. Excessively. And with varying success. 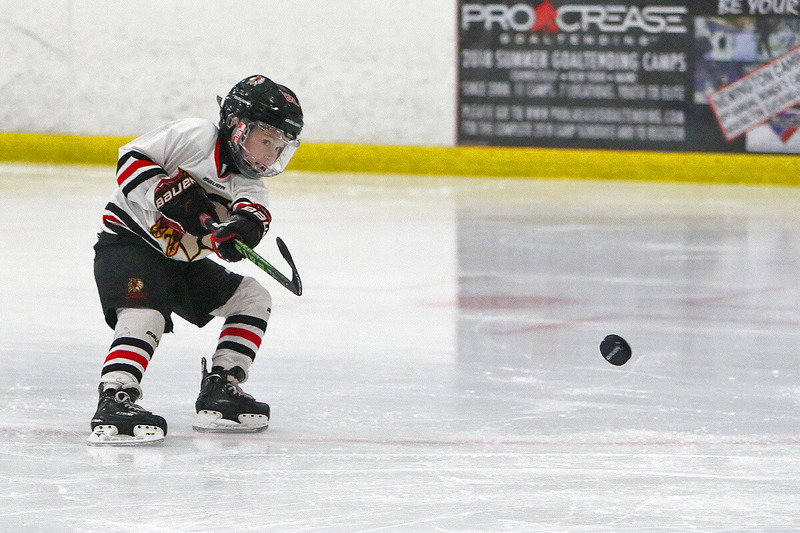 At the U8 level, specifically, the kids that are able to lift the puck (at all) are the players scoring the most goals and everyone wants to score the most goals, right? But if your son or daughter is struggling to lift the puck, try to convince them not to worry...and then do your best to tell them to quit trying so hard too. Shot velocity trumps shot placement every single time at the higher levels of hockey. 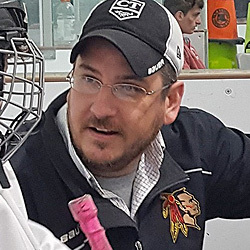 The moment a young player starts try to flip or shovel the puck into the air rather than shoot it as hard as they possibly can, they've compromised their ability to tally more points in the long run. I'll explain...after I rant a bit more about why I so despise the bar down mentality. Most often, in youth hockey, I see the bar down shot attempt after a skilled player has already deked the goalie out of position...and often times, right out of their pads too. If you're staring at a wide open net with the puck on your stick...put the puck in the net. I can't tell you how many times I've seen a shot from inside the crease hit the crossbar but not go in or, even worse, go OVER the net entirely. You see it happen in the NHL, even. And then the guilty player stares into the rafters wondering how they missed a wide open net. Patrick Kane even put one over the glass into the protective netting at the All Star game. Anytime you have the opportunity to score a sure-fire goal -- take it. If there's one way to look like a selfish tool bag, it's to miss an open net because you're trying to show off. In my experience, once goaltenders are of squirt age, they've developed far better skills when it comes to covering the top half of the net. Gone are days of some forward playing goalie for the weekend -- the kids in net now are full time goaltenders. They know what they're doing. And at this point, I mean, if you shoot high glove side, you may as well be playing a friendly game of catch with them. Shot velocities at the youth level -- even the kids with heavy handed shots -- aren't going to "beat" goaltenders. If your player has already developed the terrible habit of flipping or shovelling the puck at the net (in an attempt to get it up in the air), it's even easier for the goalies to stop it cause there isn't any velocity at all. That garbage works in mites because, one, the goaltenders generally aren't full time goaltenders, and two, they always go down to their knees and, being less than four feet tall, there's a lot of room upstairs...every time. In that example, though, that's never hitting the back of the net. And that's against a mite goalie. Hard shots, on the other hand -- specifically hard low shots -- are troublesome for goaltenders all the way up to the NHL. Reason being, the goaltenders don't have equipment to "catch" the puck on their legs. There are rebounds. Rebounds that generally fall right inside the crease off of their pillowy pads. At the NHL level, the goaltenders have somewhat mastered rebound control or know how to position themselves so that rebounds don't pop out directly in front. When you see it happen, it almost always results in a goal against. At the youth level, though, goalies are just getting in the way of the puck -- plain and simple. A low shot -- fired hard -- presents a rebound. Every. Single. Time. Here's an example from the exact same mite level game -- low shots with power. Look at those juicy rebounds?! From mites...all the way to the NHL -- rebounds lead to secondary scoring chances. I mean, every team has that one or two kids that often drift towards the corner while they unleash a heavy shot 6 feet wide of the far post and well above the cross bar too. How many goals does that lead to? Yeah, none. Legit, more often than not, that errant shot clears the puck out of the zone for the other team and, worse, sends some hanger in on a breakaway the other way. Might not look as pretty but it produces results. At a tournament that featured an individual skills competition, just last month, my oldest son Duncan (a 2009) was selected to represent his team in the Shot Accuracy event. As his parent, I found it to be an odd choice as he's not really at the top of the depth chart on his own team for any of the, em, skill events -- speed, breakways, stickhandling, hardest shot, or accuracy -- you name it, he's a middle-to-back of the pack type of player. He's just not a "skill" guy, and that's okay, so I just assumed he'd be a spectator/cheerleader for his teammates and not an active participant in any of the individual skills events. That was my expectation...and, frankly, his too. But then, in his first heat, with his nerves on full display, he beat his opponent. In the second heat, he he did it again and, as a result of never having to go to a tiebreaker round, he qualified for the final. So he took a shot at the top corner on his first shot -- clearly mimicking what his opponent had done moments earlier -- but then focused on the lower, in his mind, easier targets to hit. If he hadn't rushed, I think he could have hit more but on the shot that mattered -- his final shot -- he took his time and nailed it. 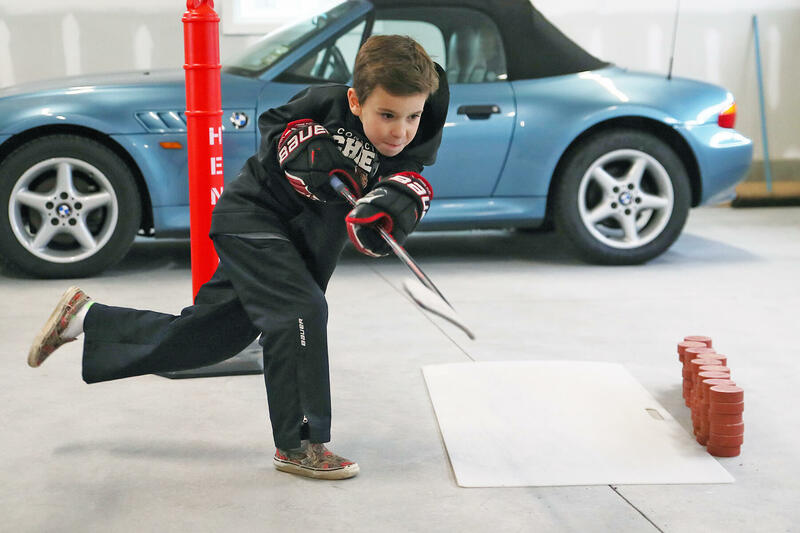 His stick taps on the ice afterwards show that he was relieved that he'd hit one but his shoulder slump, that, perhaps only a parent would catch, displayed some disappointment. He thought that he'd lost the competition. I mean, that other kid hit the top corner. Tall kid has to be the winner, right? Thing is, though, the smaller targets were worth 3 points and the larger red ones were only worth 2. Without even knowing it, he'd won the competition on his final shot. The other kid tried to go bar down on every single shot. In fact, every other kid in the competition aimed at the top corner targets for all of their shots. Read it again -- every other competitor used every single one of their attempts trying to hit the high targets. One aimed low -- and was rewarded for it. Kudos to his coach for dropping him in there. A coach that instills confidence...you find one of those, stick with them! But, really, accuracy aside -- a low shot that doesn't go in will present secondary scoring chances almost every single time. A high shot that doesn't go in doesn't offer that. Still want your 7-year old to shoot top corner every time? Spend a single off-season shooting 10k pucks, off-ice, as hard as you can and I can guarantee, by around puck 2000, every kid out there can go top corner. You can read about rolling the wrist or changing the stance or release point to your heart's delight...but it really just comes down to repetition. Work on it over and over and over again and they'll be able to do it in, probably, less than 2 weeks time. My kid can hit the top corner these days -- he just knows not to. Just make sure they shoot it hard on every attempt too. So here's a compilation video of a bunch of bar down goals. It's pretty fun to watch, right? Yeah, totally...but they're just clips of the shots that went in. What about all of the shots that missed? That didn't generate rebounds? That were wasted scoring chances? Just something to think about -- if you don't snipe that top corner...you just wasted a great scoring opportunity.